THE BLACK BOX, an exciting theater, concert, and event venue provides Franklin and surrounding towns with non-stop entertainment. In the next few weeks alone, audiences can experience everything from fantastic local bands to Broadway stars. September 21-23, THE BLACK BOX will house the Franklin Performing Arts Company’s production of Edward Albee’s Who’s Afraid of Virginia Woolf? This classic play stars local actors Nick Paone, Hallie Wetzell, and Amanda Dubois as well as New York City-based Equity actor Craig Hanson who got his start locally at the Franklin School for the Performing Arts. THE BLACK BOX closes out September with the venue’s first Oktoberfest on Sunday, September 30. From 12:30-5:00, enjoy a variety of German, as well as local craft beers with a menu of Bavarian foods, festive live music, and outdoor games. THE game will also be on during the Oktoberfest event. Families are welcome. THE BLACK BOX will host the Franklin Performing Arts Company (FPAC) annual Gala on October 6. Join the fun in an evening of great food and crafted cocktails, live and silent auctions, fantastic entertainment and dancing. The event will be hosted by Broadway’s Ben Cameron (Wicked, Footloose, Aida). Disney’s Newsies runs October 13, 14 and 19-21 at THE BLACK BOX. FPAC’s production stars Broadway’s Christopher Rice (The Book of Mormon) and is choreographed by Chaz Wolcott (Newsies, So You Think You Can Dance, Cats). Disney’s Newsies brings Broadway right to the suburbs with reasonable ticket prices and free parking in downtown Franklin. On October 26, THE BLACK BOX will present “Yacht Rock Night in Port Franklin.” Join the party crew for a West Coast celebration of light rock from the late 70s and early 80s. Musical tributes the likes of Michael McDonald, Toto, Starbuck, Steely Dan, Kenny Loggins and more, combine with three local powerhouse supergroups - Captain and The Stubings, Nantucket Sound Machine and Sal Mon Pink and The Champagnes. THE BLACK BOX New England Artists Series continues on October 27 with The Racky Thomas Band. This dynamic and truly entertaining band is a must see for not only blues enthusiasts, but for anyone who likes an uplifting, toe tapping, and booty shaking good time. Tickets for all shows and events are available at www.theblackboxonline.com or by calling the Box Office at 508-528-3370. You can follow THE BLACK BOX on Facebook, Instagram, and Twitter. 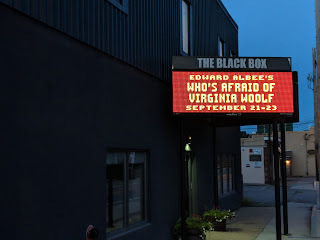 THE BLACK BOX is located at 15 W. Central St. in Franklin, MA.